Seven years on from his last appearance here Rafa returned to Hamburg. Last time he was ranked number 2 and had to beat the world number 3 to retain that ranking and then the world number 1 to take the title. This year, he came in ranked world number 10 but was the top seed. In doubles, Rafa partnered with fellow Mallorcan, 18-year old Jaume Munar. They lost to the top-seeded team of Simone Bolelli and Fabio Fognini in the first round, 4-6, 2-6. Then it was on to the singles. Straight out of the blocks he was up against Fernando Verdasco who beat him in Miami earlier this year. It was a tad worrying when he lost the first set but he put a stop to Verdasco's mini streak of victories by demolishing him in the next two sets to win, 3-6, 6-1, 6-1. He struggled a bit against Jiri Vesely, who he'd never played before, but won, 6-4, 7-6(2). It was a bit easier to beat Pablo Cuevas, 6-3, 6-2, in the quarter final. In the semis he had a medical time out for some sort of cramp or stitch that gave him problems breathing but still beat Andreas Seppi 6-1, 6-2. 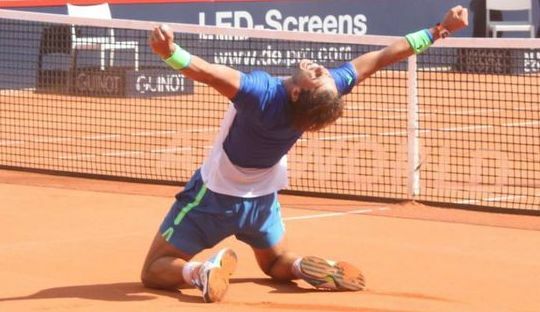 He was in the final against Fabio Fognini who had beaten him twice this year on clay. It must have done some good to his fragile confidence, therefore to beat him, 7-5, 7-5. 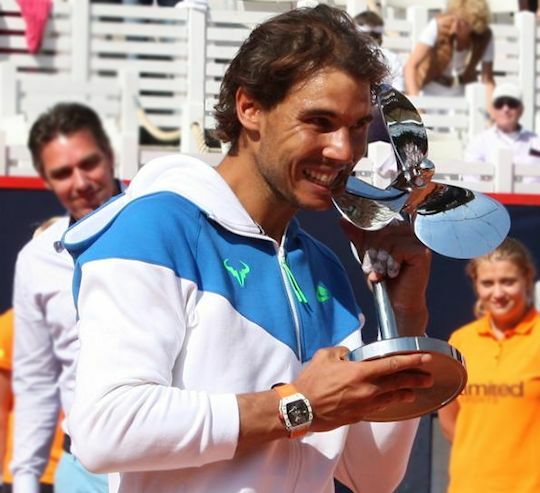 We all know it hasn't been the best of years for Rafa so we are all thrilled that he won this title. It's so great to have another winning celebration.